A hundred years ago this week… on the Western Front minor echoes of the 1914 “Christmas truce” slipped into the usual (limited but deadly) winter action with widespread artillery exchanges (December 28), British casualties when large German mines were triggered near Loos (30), and French advances in the Vosges (28) and near Mesnil-les-Hurlus, Champagne (January 1). The Russian Army continued to prove its cold-weather ability on the Eastern Front, attacking Austrian and/or German regiments in northern Bukovina (December 27-30, now Ukraine), at the River Styr (31, Galicia now Ukraine), and the Oszok and Rostoka passes (January 2, Carpathian mountains). Further south, German airships bombed Salonika (December 30), where French and British forces were trying to hold the line of the Greek border against the Bulgarians, Germans and Austrians who had conquered Serbia, and off Crete a German U-boat sank British passenger liner SS Persia (not a troopship) without warning killing 333 out of 519 (30). Meanwhile, in Gallipoli the Allied troops in the Cape Helles sector remained in place (HQ issued orders to prepare for evacuation on December 28 and the last units of the Indian Expeditionary Force at Cape Helles sailed for Egypt three days later). Last week, Sam and his older brother Ted enjoyed their happy reunion on Lemnos after the 2/1st’s remaining 200 men (out of an original thousand) –Ted never got to Suvla Bay because the Army detained him in Alexandria for dental work after he lost his front teeth in a fight (see Blog 62 13/9/15). On Christmas Day, they scoffed all the treats that caught up with them in parcels from home, washed down with free Army beer and had a lovely time – apart from a terrible encounter with the sufferings of the Arab workers “in the hole”. Whither away we knew not, nor cared overmuch, for disappointment at the interruption of our Christmas celebrations was deep and our mood doleful. To hell with everything and everybody; wasn’t that war over? So what were They up to? Many hours later we heard the unwelcome sounds of occasional gunfire and now, in darkness, when we could just make out land ahead, a shell screamed overhead and burst somewhere ashore. Our ship crept slowly forward, far too slowly for my liking, because, added to the likelihood of injury, was the unpleasant one of drowning as well; and we should by rights have been feasting and lounging on that Greek island*. Now we could make out the black shape of a big ship, berthed in the shallows head-on to the shore. Moving closer, we saw a large, square opening in her side and, the tide being just right, our shallower ship could tie up to her and we could step across into her innards and eventually emerge on to a sort of landing stage. We hurried along it before gathering, briefly, on the beach beneath towering cliffs… But no enemy fire came our way. Said the voice who had given us the warning, “That shell was from Asiatic Annie** a real big gun across the sea there in Asia Minor. When the lookout up above sees her fire, he blows his horn and we have about 30 seconds to take cover. The shells don’t always land here, of course, but we assume they will.” The informative bloke added that we had landed at V Beach and that the ship we had come through was the River Clyde*** beached there in the first Gallipoli landings months earlier. We few remaining Signallers stood together talking quietly. Short, sturdy Nieter recalled our days and nights together on that hill****; I hope I told him how much his faith in the cause and his cheery optimism had helped me when the physical after-effects of the blizzard got me down. Consultations continued between our officers and a group of strangers until, finally, orders for our disposal emerged, and a guide took Nieter, two others and myself to the strangest Signals post I ever saw. Located on the cliff top, high above V Beach, it comprised a nice, square hole with a good earth-covered roof, entry being through a “door” dug on the landward side – this last a necessity because the hole had only three sides: the seaward side didn’t exist, if you understand me. So if, in your sleep, you rolled in that direction just a little too far, you must, eventually and too late, realise that your next stop was the beach way down below. On that open side, curtains made of sacking concealed our candle lights. We had blankets and a rough table or bench with boxes for seats; we worked on instruments far superior to those we carried, and a small, simple exchange or commutator enabled us to link certain Signal posts. Evidently, here the Army conducted the war on a more civilised level than had been the case at Suvla Bay, largely because the April landings had driven the front line much farther inland from the beaches. No cooking in mess tins over methylated heaters – we four would take our meals in rotation at a small Royal Army Medical Corps camp nearby. ‘In fact, we spent a few pleasant days on that job. From our clifftop, the activities around the beach provided interest in idle moments. Not in any way separate, the RAMC men quickly appeared and bustled among the casualties quietly doing their good work. The lookout on the tower must have been missing. One of our chaps said they [the civilians] were Greeks brought in to do construction work. That seemed strange to me, civilians working close to a battlefront. Soon, an order came through for us Signallers to disconnect everything, take all the equipment down to a store on the beach, then rejoin our Battalion. A guide took us to where they were living in a series of square holes not far from the beach all connected by a long trench. At last, we learned the reason for our return to Gallipoli; we were to work every night at dismantling and loading stores on to lighters and small ships. Night work only, in order to conceal evacuation preparations. We could take some rest during the day – but, should enemy planes appear, like the occasional small groups of Taubes we’d seen high above Suvla, we must expose ourselves, move around as though busy upon routine matters, and generally try to convince the observers that our numbers were as great as at any previous time. Shortly after dawn that first morning back with our crowd, a lone plane did fly back and forth over our area, so we put on our busy act for the pilot’s amusement and information. Quite rightly, acting on instructions, some of our men fired their rifles upwards – imagine our surprise, though, when the pilot dropped a bomb. It exploded much too close for our liking and caused a brief interruption to our “busy bee” programme. That was the first time I’d thought about the possibility of planes carrying bombs. Probably the pilot hurled it out of his cockpit. Although it could only have been a small one, it made quite an impressive bang. Still, no harm done, so nobody worried too much about air-bomb possibilities. However, soon after that incident, one of our chaps approached our position, a message in his hand, when another low-flying plane appeared. Our friend more or less disintegrated before our eyes. Sheer bad luck placed him in the spot where bomb Number 2 exploded, poor fellow. So, very early in that distant war, did I see death from the air strike a man down. One day, we were watching a water cart coming our way – no shortage of water there, unlike at Suvla; the cart consisted of a tank on an axle and two wheels pulled by a mule and driven by an elderly member of our transport section who we knew to be rather deaf. We heard a plane coming and yelled a warning, but he obviously heard nothing. The plane appeared, flew low, and a strange swishing sort of sound followed ­– but no explosion. Some of us dashed out to the rather puzzled old chap to tell him what had happened and persuade him to shelter for a while. That he scornfully refused to do and he went on about his business. Then one lad let out a shout. We ran over to him and he pointed to a six-inch-long metal dart protruding from the earth. That set us all searching and acquiring further specimens, some lying on rocks, others dug out where small holes indicated their presence. A shower of darts had scattered around mule, water cart and the lucky old driver, but all was well. The one I found was heavy, thick at the head, then slim, and the tail had enough flukes to cause rotation when falling. The inventor presumably thought this might aid penetration of the victim’s head – bearing in mind that steel helmets for soldiers had not yet been introduced. I thought about the method of delivery employed and guessed at a box with apertures at the bottom and a sliding grid operated by the pilot. I kept my dart as a prize souvenir, until it vanished in a kitbag I lost some time later. 'No Signals work was required at that time, for the Battalion’s numbers had dwindled to about Company strength****** and our work concerned simply helping to prepare for evacuation. Our Signals group landed a lovely job which consisted of going to a large dump near the beach and gradually dispersing its contents: canned and bottled food and drink intended as extras for officers – anything that would keep well in cans, boxes, cartons, with smoked items in cotton wraps, also biscuits, some cakes and sweets, wines, beers, but not much in the way of spirits. We loaded these good things on to small mule carts. Quite fairly, we were not allowed to take anything away from the dump for our own use; but we would be entitled to a share of what was delivered to our Battalion. In fact, we Signallers hadn’t the gall to accept our share when it was offered since we stuffed ourselves to capacity during the night and, in daytime, only wanted to sleep. But we did work with a will on the job – and so shortened its duration, unfortunately. 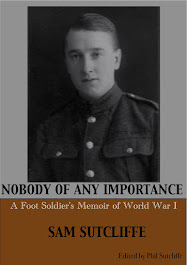 * H. Montgomery Hyde’s Strong For Service, biography of the 2/1st’s beloved commanding officer, Major Harry Nathan (later a lord and member of Clement Attlee’s post-WW2 Labour Government), says that, while he was eating his Christmas dinner, Nathan received the order that the Battalion remnants must return to Gallipoli. But he must have decided not to spoil the fun and withheld the bad news from his men until the Sergeant’s vocal reveille the following morning. ** Asiatic Annie fired from a 17th-century fort called Kumkalle in a place called Tepe, five kilometres from the site of ancient Troy, aiming at V Beach (where my father’s Battalion had landed) and W Beach on Cape Helles. *** SS River Clyde: a collier launched in March, 1905, adapted as a landing ship in 1915; that April, she sailed from Mudros to Cape Helles V Beach; bombarded from the cliffs, she was beached to serve as a bridge for landings and then for returning wounded; six of the River Clyde’s crew were awarded VCs; the apparent hulk was later repaired and sold to Spanish owners who used her as a Mediterranean tramp steamer until finally scrapping her in 1966; on April 15, 1915, V Beach, only 300 yards long, became one of five main Allied landing places on Cape Helles; it was overlooked by cliffs, a fort and an ancient castle, Sedd el Bahr Kale, occupied and defended by the Turkish Army, but captured on April 26. 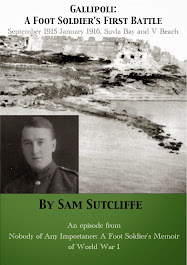 **** See recent blogs passim for more on Lance Corporal Signaller Peter Nieter, Sam’s mate since training on Malta, Feb-August, 1915, and their manning of a Signals post/hole on a Suvla Bay hilltop overlooking the Turkish lines. ***** Charles Samson: 1883-1931, says Wikipedia, born Manchester, one of the first four Royal Navy pilots, and the first to fly an aircraft from a moving ship (1912); he won the Distinguished Service Order for activities on the Western Front, earning promotion to Commander; he was sent to Gallipoli in March, 1915; different accounts have him recalled to London either in November, 1915, or at the end of the Gallipoli campaign – but a Fleet Air Arm Museum Tweet notes him flying from his base on Imbros to drop a bomb on December 18, 1915, which supports the suggestion that he stayed around Gallipoli to the last, and that my father’s informant was correct and Samson did fly over British troops on V Beach in January, 1916. ****** My father several times noted that “a couple of hundred” of the original thousand-man Battalion survived Suvla Bay. But his reference here to a presence more like Company strength at V Beach may connect with what he told me years ago in conversation which was, if memory serves, that 147 of the Battalion got out of Gallipoli intact (a Company numbering around 100). 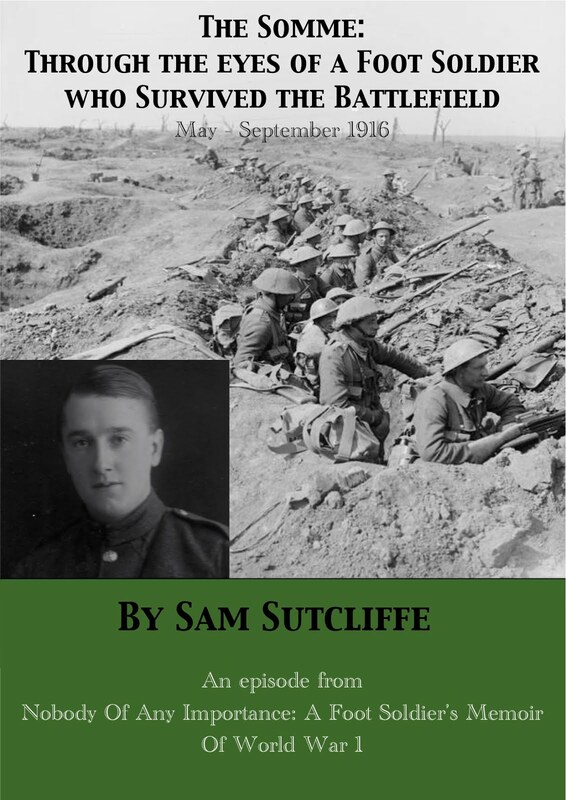 Next week: It’s Gallipoli evacuation day déjà vu all over again for the 2/1st Fusiliers – meanwhile, Sam and comrades make pretend raids and get shot at with real bullets, before their second great getaway (losing Corporal Bebb en route… and finding him again). A hundred years ago this week… while the weather, rather than the festivities, slowed the war on Western and Eastern Fronts deadly action proceeded – at Hartmanswillerkopf where the French Army attacked and took 1300 German prisoners, then got beaten back again (December 21-2, Vosges), at De Panne where German planes bombed the King and Queen of Belgium’s home from home (20, Flanders), on the River Strypa where the Russian and German Armies fought fiercely (24, Ukraine) and in Bukovina where the Russians assailed the Austrian Army (27, then Moldavia, now Ukraine/Romania). On Greece’s northern border where French and British forces intended to hold a line after the German/Austrian/Bulgarian conquest of Serbia, 120,000 Bulgarian soldiers gathered (22) – while the Italians who had taken Durazzo on the Albanian coast provided a diversion for the Allies. Much further south, the extraordinarily widespread Russian Army continued gnawing at western Persia, occupying Kum (20) and Kangavar (25), while in neighbouring Mesopotamia Ottoman forces attacked the besieged British garrison at Kut on the Tigris (23 and Christmas Day), and down on Lake Tanganyika two British Navy motor boats, the cutely named Mimi and Toutou, captured German gunboat Kingani (December 26 – and maybe just a little something to do with The African Queen, which will again get a couple of outings on British TV this Christmas week). Last week, Sam and the 200 remaining from the 1000-man Battalion which sailed from Egypt in September, experienced the joy and relief of escape from that terrible campaign, then the wretched dejection of defeat. 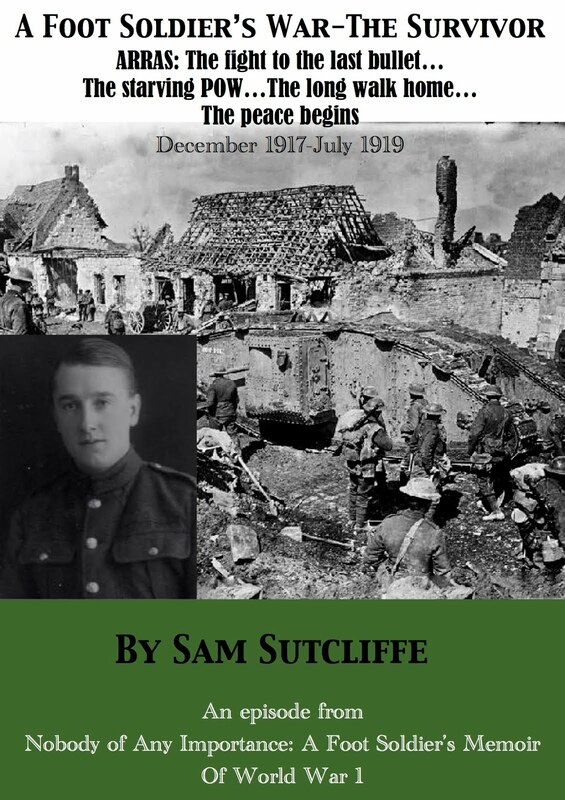 But Sam’s spirits were lifted by a surprise reunion with his older brother and fellow Fusilier Ted (19 by then) whom he’d last seen on the docks at Alexandria being led off their troopship because the medics said he couldn’t serve in Gallipoli without his front teeth – which had been knocked out in a fight with another soldier. ‘Next morning, Drake, a fellow Signals Lance Jack, and I were told to go searching for missing communications, so to speak. In fact, we were to board a steam pinnace – lent by the commander of a battleship – go round to the east side of the island and search for mail dumped there; it had been allowed to accumulate while we were on active service because transport to deliver it had not been available. In charge of the trim, little vessel was a midshipman, a lad of about my age, quite pretty with his pink cheeks, his immaculate uniform, but a fine young officer. He had a rating for crew. Off we puffed round the coast after leaving the big harbour. East Mudros* had a useful jetty and, going ashore, Drake and I found piles of full, canvas mailbags — a quantity commensurate to the full Battalion of a few months back. We began carrying them back to the pinnace and stacking them on the deck. By the time we’d loaded up there was little to be seen of the boat but her funnel. Not a word of complaint came from the young officer, though. The cherubic smile, the acceptance of things as they were, inspired me, given that almost all my companions of late had been depressed by the pervading feeling of material poverty and defeat. Happy in the knowledge that we were accomplishing a really useful mission, to avoid rolling overboard Drake and I crawled over the sacks, seeking places with handholds. I spotted a sort of handle near the top of the funnel, clambered up and held on there. Drake jammed himself close to the small superstructure which housed the steering wheel, the rating, and the midshipman. I had my doubts that they could see where they were going, but of course they managed fine. Just as we cast off, someone came running towards the landing stage, waving. It was Jackson, the man whose spectacles had been damaged one dark night on machine-gun hill**. Before we passed out of hearing, he yelled that he had temporary glasses he could just about see with, and he was awaiting shipment to Egypt. His rosy face was all smiles and his wife and children could surely hope to see Daddy before long. Back in Mudros, Drake and I did no unloading, for an eager party of helpers awaited delivery of the first mail many of them had seen for some months. We two got down to eating a meal thoughtfully saved for the two heroes of the moment. By candlelight, we all read late into the night, each concerned with his own news and feelings. Ted and I had a couple of parcels each from our parents, letters too. He also had some small packages from girlfriends. Among many nice things, our parents had sent photographs of our family taken in the back garden. Our baby sister*** was standing there, now able to do so without help. Our young brother looked bonny, the older sister all smiles, the ever solemn dad still solemn, while mother wore her usual rather stern expression. It was good to have this reassuring picture, visible proof that life at home had not greatly changed. Father’s letters, written in his impeccable hand, gave us a clear picture of the national scene as he understood it, and Ma’s gave us news of family and local happenings. All was well there, and that was great. I also received several long, interesting letters from my school friend Charlie****, the draper’s son, telling me about his life in the newly formed Royal Naval Air service, first at Howden in Yorkshire, and later at Cardington in Berkshire. ‘Christmas nearly upon us and, next morning, our generous Major***** had our crowd assemble and announced that arrangements had been made for a supply of beer, lots of it, to be collected from the Forces’ Canteen. Volunteers, genuine on this occasion, set off, carrying the large dixies in which the cooks normally prepared stews or tea. When they returned, noticeably more talkative and cheerful than before, they carried far more beer than it appeared likely we could cope with. The distribution of cakes, biscuits, Christmas puddings and sweets from the parcels of absent comrades followed — such a plenitude of good eatables compared with the scarcity during recent months. We came upon a village with several small shops and a number of our fellow soldiers, British and ANZAC, wandering about. We had no money, but out of curiosity we entered one shop and were surprised to see the Greek man and woman who ran it, and all their stock, sat behind iron bars. We had seen something similar in post offices and banks back home, but usually those bars were made of brass, whereas this black, iron enclosure had the aspect of a prison. However, justification for the bars appeared almost instantly when an altercation between a Scot and an Australian flared up. The Scot wanted a loaf of bread similar to one he’d purchased previously at about eightpence. The shopkeeper told him today’s price was two shillings. The colonies were paying this without demur, while the Scot knew that, at home, a bigger loaf than this could be bought for threepence or less. So the eightpence he offered appeared more than generous to him out of about seven shillings weekly Army pay. He upbraided the Aussies for spoiling the market just because their Government treated them far more generously than ours did British soldiers. * I’m somewhat confused about this little trip on the pinnace. My father writes that they sailed around to the east side of Lemnos, which would mean leaving Mudros bay/harbour. But “East Mudros” seems to be a small place on the east side of Mudros bay. So his wondrous memory was probably wrong on one detail or another here. My guess, given his detailed recollection of their voyage, is that they did sail out and round to the east side of Lemnos and that he misremembered the place name - but I can’t be sure! If anyone knows where that mail dump was, please tell me and put me right for a corrected footnote in the next “edition”. ** See Blog 69 Nov 11, 2015, for the story of how my father “accidentally” ended family man Bill’s Suvla campaign by kneeling on his glasses in the middle of the night – in the Signals post/hole they shared on what Sam names “machine-gun hill” after their neighbours, a veteran Essex Regiment unit who became his friends and, to a degree, protectors. *** The “baby sister”, not mentioned before (a little more background in the Afterword when you get there): Edith “Edie” Minnie Sutcliffe, born May 22, 1912, at 26, Lowden Road (see endnote 7). ***** Harry Nathan, the Battalion’s never forgotten leader/hero. Next week: The “lovely day tomorrow” ends in the small hours with a Sergeant’s roar and Boxing Day sees the remnants of the Battalion sailing back to Gallipoli!